The self-paced Basics of Storeroom Management Training Course is for people whose main focus is storeroom management. The training course provides a general understanding of spare parts inventory management and teaches you how to determine the most appropriate stock holding level. The training course then focusses on both the physical and procedural aspects of storeroom management. This course is based on modules 1, 2, 6, and 7 of our Advanced Spare Parts Management program. How to manage rotable and repairable spares. The issues to address in developing a spare parts identification system. The pros and cons of spare parts standardization. How to improve results with high quality materials data. The difference between Accounting Accuracy and Storeroom Accuracy and why it matters. The factors that most directly affect spare parts inventory accuracy. How to plan for and execute the three phases for conducting a successful stock take. How to achieve a 100% accurate inventory. The Basics of Storeroom Management Training course is designed for those who work in or supervise the storeroom/warehouse activity. Each module includes an online quiz. 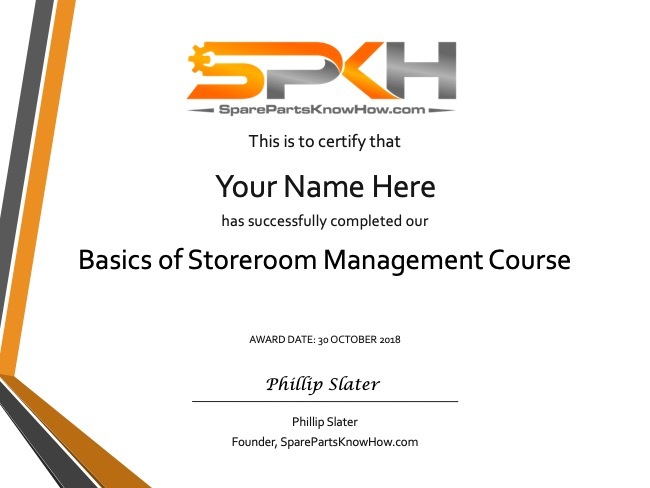 Successfully completing all four of the online quizzes leads to the award of our Basics of Storeroom Management Course certificate. We set the ‘pass’ level for these quizzes at 80%. Please note that the course The Basics of Storeroom Management course certificate will be forwarded to your registered email address within 7 days of course completion.